How to insert picture in Excel: fit image in a cell, add to comment, etc. 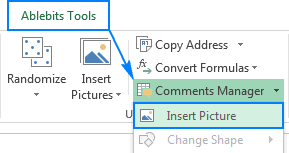 The tutorial shows different ways to insert an image in Excel worksheet, fit a picture in a cell, add it to a comment, header or footer. It also explains how to copy, move, resize or replace an image in Excel. While Microsoft Excel is primarily used as a calculation program, in some situations you may want to store pictures along with data and associate an image with a particular piece of information. For example, a sales manager setting up a spreadsheet of products may want to include an extra column with product images, a real estate professional may wish to add pictures of different buildings, and a florist would definitely want to have photos of flowers in their Excel database. In this tutorial, we will look at how to insert image in Excel from your computer, OneDrive or from the web, and how to embed a picture into a cell so that it adjusts and moves with the cell when the cell is resized, copied or moved. The below techniques work in all versions of Excel 2016, Excel 2013, Excel 2010 and lower. All versions of Microsoft Excel allow you to insert pictures stored anywhere on your computer or another computer you are connected to. 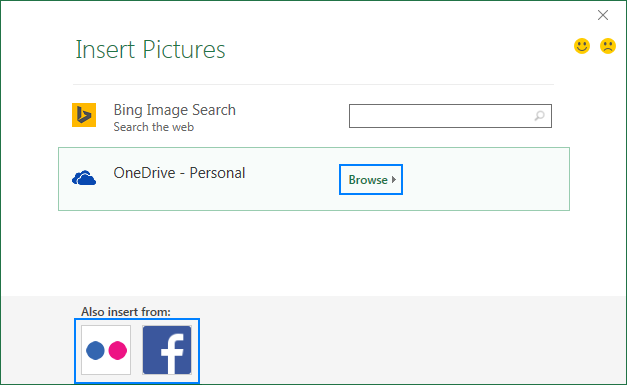 In Excel 2016 and Excel 2013, you can also add an image from web pages and online storages such as OneDrive, Facebook and Flickr. In your Excel spreadsheet, click where you want to put a picture. Switch to the Insert tab > Illustrations group, and click Pictures. In the Insert Picture dialog that opens, browse to the picture of interest, select it, and click Insert. This will place the picture near the selected cell, more precisely, the top left corner of the picture will align with the top left corner of the cell. Done! Now, you can re-position or resize your image, or you can lock the picture to a certain cell in a way that it resizes, moves, hides and filters together with the associated cell. 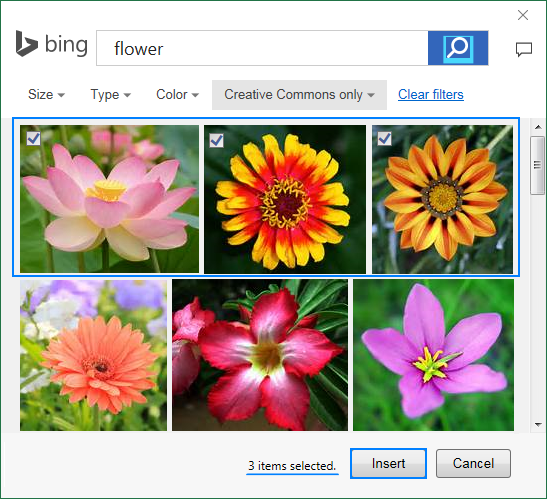 If you are looking for something specific, you can filter the found images by size, type, color or license - just use one or more filters at the top of the search results. Note. If you plan to distribute your Excel file to someone else, check the picture's copyright to make sure you can legally use it. Click the Facebook or Flickr icon at the bottom of the window. Note. 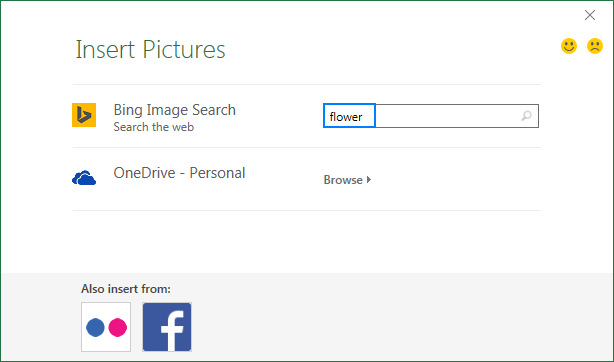 If your OneDrive account does not appear in the Insert Pictures window, most likely you are not signed in with your Microsoft account. To fix this, click the Sign in link at the upper right corner of the Excel window. 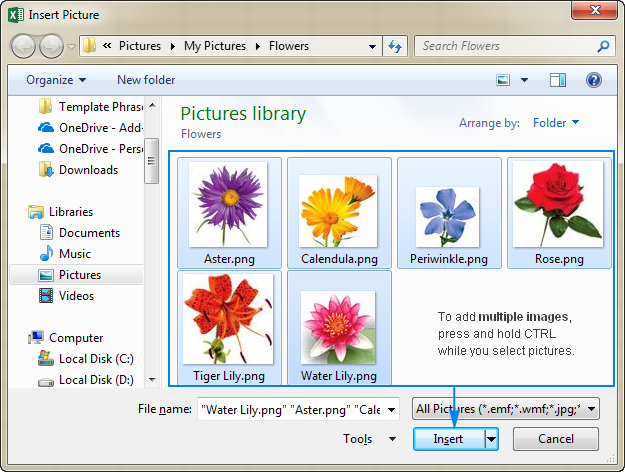 Select an image in another application, for example in Microsoft Paint, Word or PowerPoint, and click Ctrl + C to copy it. 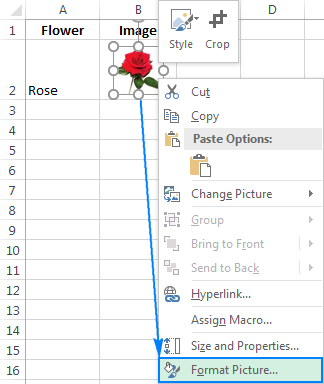 Switch back to Excel, select a cell where you want to put the image and press Ctrl + V to paste it. Yep, it's that easy! 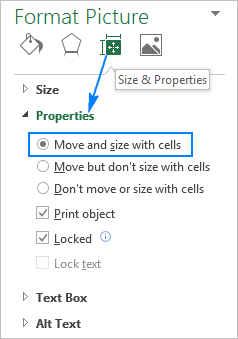 Resize the inserted picture so that it fits properly within a cell, make the cell bigger if needed, or merge a few cells. On the Format Picture pane, switch to the Size & Properties tab, and select the Move and size with cells option. Now, when you move, copy, filter or hide the cells, the pictures will also be moved, copied, filtered or hidden. The image in the copied/moved cell will be positioned the same way as the original. As you have just seen, it's quite easy to add a picture in an Excel cell. But what if you have a dozen different images to insert? Changing the properties of each picture individually would be a waste of time. With our Ultimate Suite for Excel, you can have the job done in seconds. Select the left top cell of the range where you want to insert pictures. On the Excel ribbon, go to the Ablebits Tools tab > Utilities group, and click the Insert Picture button. Fit to Cell - resize each picture to fit the size of a cell. Fit to Image - adjust each cell to the size of a picture. 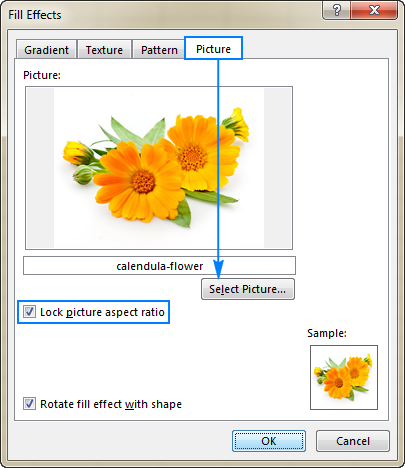 Specify Height - resize the picture to a specific height. Select the pictures you want to insert and click the Open button. Note. For pictures inserted in this way, the Move but don't size with cells option is selected, meaning the pictures will keep their size when you move or copy cells. Create a new comment in the usual way: by clicking New Comment on the Review tab, or selecting Insert Comment from the right-click menu, or pressing Shift + F2. Right click the border of the comment, and choose Format Comment… from the context menu. If you are inserting a picture into an existing comment, click Show All Comments on the Review tab, and then right-click the border of the comment of interest. 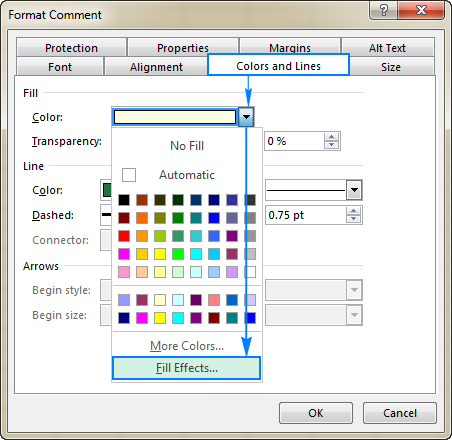 In the Fill Effect dialog box, go to the Picture tab, click the Select Picture button, locate the desired image, select it and click Open. This will show the picture preview in the comment. Click OK twice to close both dialogs. Select a cell where you want to add a comment. On the Ablebits Tools tab, in the Utilities group, click Comments Manager > Insert Picture. Select the image you want to insert and click Open. Done! Click the area inside the header or footer where you want to insert the picture. This should take you to the Design tab. On the Design tab, in the Header & Footer Elements group, click Picture. As you have just seen, Microsoft Excel provides a numbers of different ways to insert an image into a cell or in a specific area of a worksheet. But did you know you can also copy information from one Excel sheet and insert it in another sheet as an image? This technique comes in handy when you are working on a summary report or assembling data from several worksheets for printing. Copy as Picture option - allows copy/pasting information from another sheet as a static image. Camera tool - inserts data from another sheet as a dynamic picture that updates automatically when the original data changes. To copy Excel data as an image, select the cells, chart(s) or object(s) of interest and do the following. 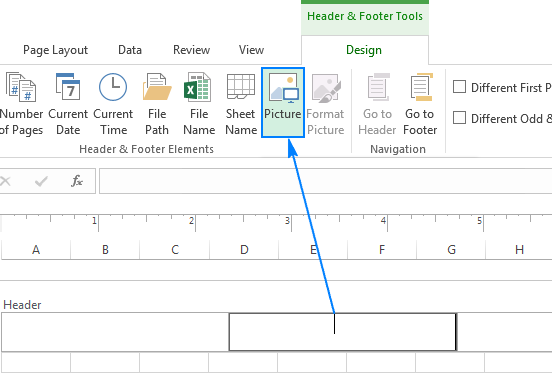 On another sheet or in a different Excel document, click where you want to put the picture and press Ctrl + V.
That's it! The data from one Excel worksheet is pasted into another sheet as a static picture. To begin with, add the Camera tool to your Excel ribbon or Quick Access Toolbar as explained here. Select a range of cells to be included in the picture. To capture a chart, select the cells surrounding it. In another worksheet, click where you want to add a picture. That's all there is to it! Unlike the Copy as Picture option, Excel Camera creates a "live" image that synchronizes with the original data automatically. After inserting a picture in Excel what is the first thing you'd usually want to do with it? Position properly on the sheet, resize to fit into a cell, or maybe try some new designs and styles? The following sections demonstrate some of the most frequent manipulations with images in Excel. To adjust the position of a picture in a cell, press and hold the Ctrl key while using the arrows keys to reposition the picture. This will move the image in small increments equal to the size of 1 screen pixel. To move an image to a new sheet or workbook, select the image and press Ctrl + X to cut it, then open another sheet or a different Excel document and press Ctrl + V to paste the image. Depending on how far you'd like to move an image in the current sheet, it may also be easier to use this cut/paste technique. 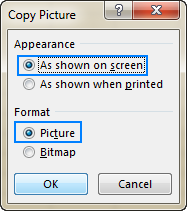 To copy a picture to clipboard, click on it and press Ctrl + C (or right-click the picture, and then click Copy). After that, navigate to where you wish to place a copy (in the same or in a different worksheet), and press Ctrl + V to paste the picture. The easiest way to resize an image in Excel is to select it, and then drag in or out by using the sizing handles. To keep the aspect ratio intact, drag one of the corners of the image. Another way to resize a picture in Excel is to type the desired height and width in inches in the corresponding boxes on the Picture Tools Format tab, in the Size group. This tab appears on the ribbon as soon as you select the picture. To preserve the aspect ratio, type just one measurement and let Excel change the other automatically. Remove the image background (Remove Background button in the Adjust group). Improve the brightness, sharpness or contrast of the picture (Corrections button in the Adjust group). Adjust the image colors by changing saturation, tone or do complete recoloring (Color button in the Adjust group). Add some artistic effects so that your image looks more like a painting or sketch (Artistic Effects button in the Adjust group). Apply special picture styles such as 3-D effect, shadows, and reflections (Picture Styles group). Add or remove the picture borders (Picture Border button in the Picture Styles group). Reduce the image file size (Compress Pictures button in the Adjust group). Rotate the picture at any angle and flip it vertically or horizontally (Rotate button in the Arrange group). To restore the original size and format of the image, click the Reset Picture button in the Adjust group. The new picture will be placed exactly in the same position as the old one and will have the same formatting options. For example, if the previous picture was inserted into a cell, the new one will also be. To delete a single picture, simply select it and press the Delete button on your keyboard. To delete several pictures, press and hold Ctrl while you select images, and then press Delete. Press F5 key to open the Go To dialog box. Click the Special… button at the bottom. 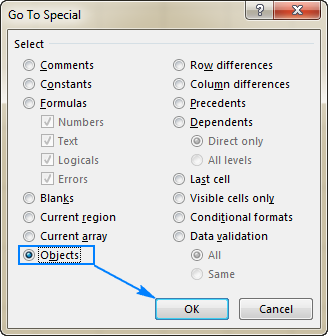 In the Go To Special dialog, check the Object option, and click OK. This will select all pictures on the active worksheet, and you press the Delete key to delete them all. Note. Please be very careful when using this method because it selects all objects including pictures, shapes, WordArt, etc. So, before pressing Delete, make sure the selection does not contain some objects that you'd like to keep. 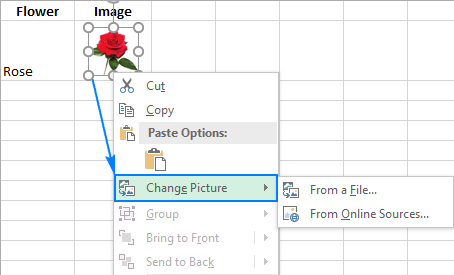 This is how you insert and work with pictures in Excel. I hope you will find the information helpful. Anyway, I thank you for reading and hope to see you on our blog next week! 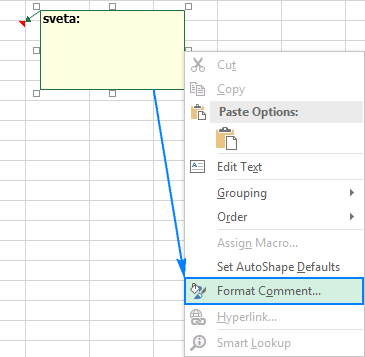 11 Responses to "How to insert picture in Excel: fit image in cell, add to comment, header or footer"
Thanks, Svetlana. for your post. I am trying to add a picture to a comment. I do not have all of the options for formatting. The only option I have in formatting is font. Could this be because I am using Excel 2010? Any ideas? please take a closer look at this point of the article above. It shows step-by-step example screenshots on how to add a picture to a comment. If this doesn't work, please consider trying our Comments Manager tool. It has an option to quickly add any picture to the cell comment in Excel. You can find the instructions on how to work with Comments Manager on this help-page. Hi there! I am trying to insert an image into a cell and I followed your directions exactly above and it's still not working right. It still "floats" on the spreadsheet and is not truly in the cell if that makes sense. I have already resized and selected "move and size with cells" but it still doesn't work right. Any thoughts? I am using Office Professional Plus 2013. Thank you! How can I print exile with title bar using my Lexmark printer? the function to change the picture is suddenly gone and I cant find any function for this. When inserting a new picture I do an overlay now. But the quality is very bad after saving the file as a pdf to send it to a customer. In my Excel file that i have been using for a year I inserted photos but now they are locked, I cannot access, delete, change them nor can I insert new ones . How to proceed? After I insert a picture in a cell, how do I refer to it so that it appears in a specific cell on another worksheet based on a drop-down list? We insert logo images on our Excel docs (Office365 vers). Unfortunately, when others open the doc, that logo is looking 4 to 5 times larger in print preview and print. I've tried to reformat the size, to no avail. How does this get corrected? I don't want to change every doc to a pdf. Thanks. I want to make picture image as grouping where is this group icon available .